Super Once a day Timed release multi-vitamin vitamin supplement. Excellent quality multivitamin and mineral tablets. Quest Super once a day are an essential one for everyone old or young. I wouldn't be without mine. The big pot may look expensive initially, but considering this is a 6 month supply of the highest quality once a day, timed release vitamins, is 18p a day more than your health is worth? For the hard training athlete or bodybuilder I would suggest taking 1 multi-vitamin / mineral tablet twice a day to ensure complete and absolute coverage of your bodies vitamin and mineral requirements. Vitamin or mineral deficiency will hinder performance and recovery especially when pushing your body to the limit. 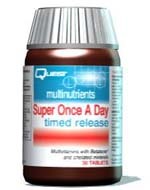 SUPER ONCE A DAY Timed Release is a high potency supplement containing the B Complex, plus other vitamins and minerals. The formulation offers amino acid chelated minerals for maximum absorption. SUPER ONCE-A-DAY Timed Release gradually releases water soluble vitamins B and C over a 6 hour period, ensuring a more constant nutrient supply for efficient use by the body. Suitable for those eating normal size meals, SUPER ONCE-A-DAY can be taken to maintain overall good health or as an insurance against low intakes in the diet.